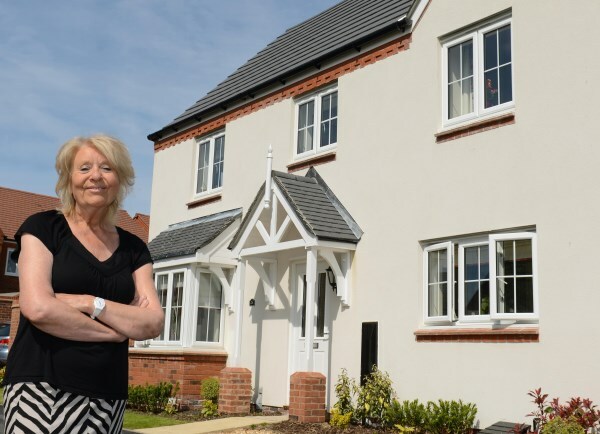 When Susan Maxwell decided to move back to Shrewsbury after 20 years away, she chose a brand-new Montpellier home at Bovis Homes' Bowbrook Meadows location. "At my time of life - I'm 65 now - I didn't want a project," she says. "I didn't want a house that needed anything doing to it. I've had the walled garden with the pretty cottage in the village but now I'm on my own, I wanted a place that's plug-and-play and ready to rock and roll! "I lived in Shrewsbury for 35 years and brought up my family in Shropshire," adds Susan, explaining her close connection to the area. "Then 20 years ago, I went to work in Aylesbury for the English Bridge Union, which is the governing body of the game of bridge." She always planned to move back to the town at some point, however. "I have two grandsons here, who live close by; my sister lives here; my niece; my nephew; and a lot of family friends, so I was always going to come back." When the time came, she followed the advice of friends and family and sold up in Aylesbury before she had a confirmed purchase in Shrewsbury. "Everybody told me to do that so I would have a bit more leverage, but what happened then was that I sold my house and had nowhere to live!" she says with a chuckle. "I was commuting between my job in Aylesbury and York where my daughter lives, and coming up to Shrewsbury whenever I could to look for a property." Susan knew she wanted a new-build, and having bought off-plan before, she was familiar with the process. She initially decided on The Sheringham housetype at Bowbrook Meadows, but finally settled on The Montpellier, which is a four-bedroom detached home. "I went to have a look and the first thing I noticed was the wide open spaces on the development. There were lots of landscaped areas and where I am at the front and side of me I've got this parkland which is absolutely lovely." She was also very taken with the look of the property. "It's a pretty house. It looks lovely and from the front especially it looks absolutely gorgeous," she says. "And the finishing on the inside of the house is very much better than I thought it was going to be. The windows and the windowsills are very substantial, and they look super. This is my third new home on the trot now and the finish on the last one was nowhere near as good as Bovis Homes is on the inside." She was full of praise for sales advisor Kerry Dolman and Rob Tarn, who was assistant site manager at the time but who has now moved on to a health and safety role in Bovis Homes. "Both Rob and Kerry were absolutely amazing. They did everything they could to get me in before Christmas and I moved in on 18th December," she says. "They were wonderful - like family really." She is now looking forward to her first summer in her new home. "It's a super house; beautifully designed inside, it really is. I've had the garden landscaped separately and I've had a terrace put in at the back - just in time for summer!"